Rudy Giuliani speaks during a memorial in NYC on September 24, 2013, for members of Iranian dissident group Mujahedeen-e-Khalq (MEK). Photo by Mario Tama/Getty Images. Close Trump associates have been quietly meeting with a controversial Iranian opposition group that was only recently removed from the U.S. terror list, TYT has learned. Rudy Giuliani, President Trump’s personal lawyer, and John Bolton, Trump’s National Security Advisor, met with the group five separate times since Trump’s inauguration, according to Justice Department documents reviewed by TYT. The documents were submitted to the Justice Department by the National Council of Resistance of Iran (NCRI)—MEK’s political wing—under the Foreign Agents Registration Act, between July 20, 2017 and June 27, 2018. That group, the People’s Mujahedin of Iran, or MEK for short, was designated a terrorist organization by the U.S. State Department until 2012, at which point it was removed from the State Department’s terror list after an intense lobbying effort. The group was on the terror list for good reason: MEK has killed several American servicemembers and contractors; attempted to assassinate a top U.S. general; and attempted to kidnap the U.S. Ambassador to Iran, Douglas MacArthur II. In 1992, the MEK conducted a terror attack on the Iranian mission to the United Nations in New York, making it one of the few terror groups to have operated on U.S. soil, according to Daniel Benjamin, the former coordinator for counterterrorism at the State Department. 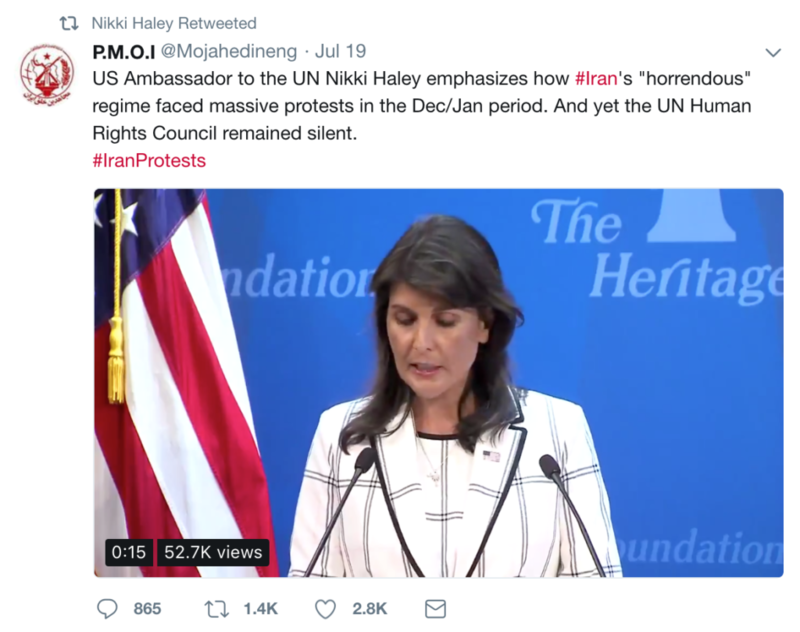 Nikki Haley, Trump’s U.N. ambassador, retweeted MEK’s official Twitter account in July. Although Trump has said he is open to diplomacy with Iran and that he merely ended the Iran Deal in search of a “better deal,” administration officials like Bolton have advocated for regime change in Tehran. Bolton concluded the speech by promising regime change before 2019. These may not be empty words. On Thursday, the Australian Broadcasting Corporation reported that the Trump administration is preparing to bomb Iran’s nuclear facilities “as early as next month,” citing senior figures in the Turnbull government.